6 Hot Pink Baroness Roses 12"
3 Gemini Roses (hot pink & white) 8-10.5"
2 Sunset Celebration Roses (orange)10.5"
4 New Zealand Roses (champagne ) 8-10.5"
4 Orange Ranunculus 4.5" - 10.5"
7 Yellow Ranunculus 4.5" - 10.5"
9 Pink Sweet Pea stems 6 - 9"
2 Fushia Bougainvillea stems 14"
6 Calamondin Lime stems (tiny oranges)14"
4 Privot berry stems 10 - 12"
The colors in the arrangement are "hot", that is to say it has intense hues of hot pink, bright orange, and yellow. These are the dominant colors in the arrangement, but it also has a few softer pink and yellow pastels in it too. 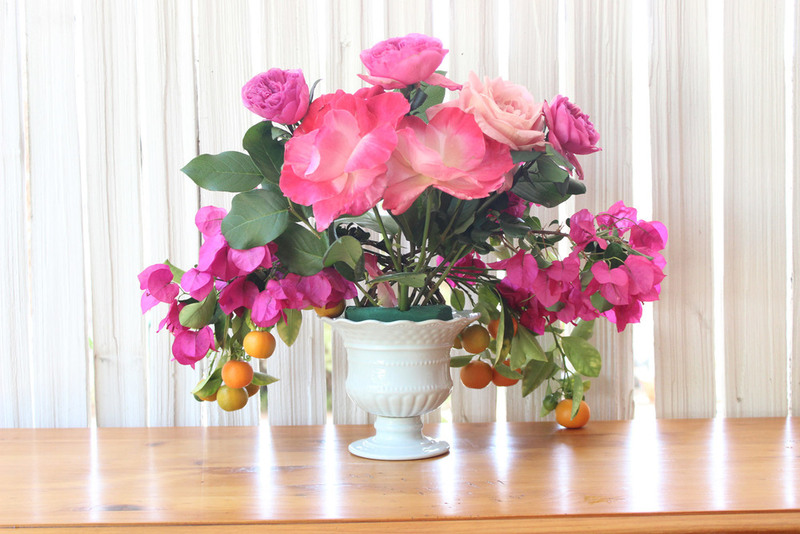 I ordered the Hot Pink Baroness Roses from the Flower Mart, but the larger roses are garden roses, cuttings from my friend's garden. They are the first roses of the season, and therefore some of them are very large. 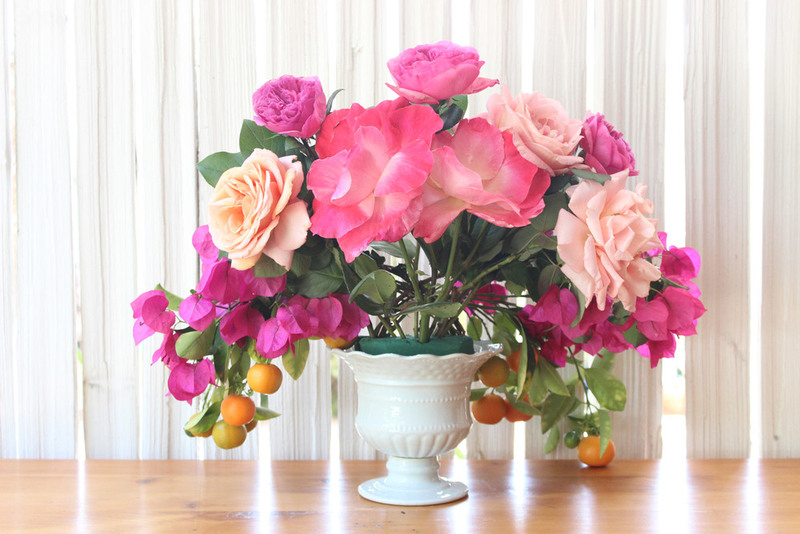 The Gemini roses (the very large hot pink and white roses,center stage in the arrangement) had a diameter of about 5 or 6 inches. Incredible. You cannot buy these at the Mart, or at any store, so if you would like to have some of these blooms, plant a garden. 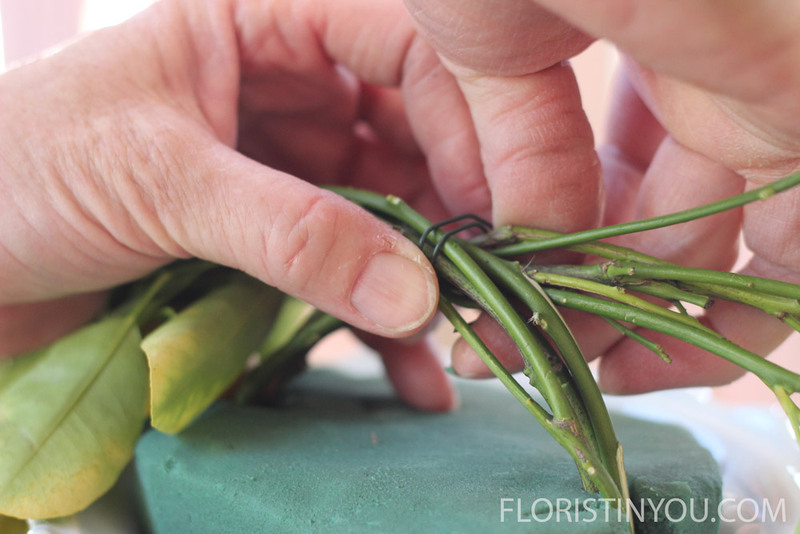 You will need to remove the thorns off all the roses, Calamondin Lime branches, and bougainvillea. Then wire all of the roses. See 'Flower Prep' under 'My Best Secrets' for instructions. This time of year, hot pink bougainvillea is growing all over Southern California. If, by the way, anyone asks, I didn't climb on the side of my car door to snip these lovely ladies! Good thing I don't care if I put a little dent in the top of my van. The 'tiny oranges' are Calamondin Limes that ripen in early Spring in Southern California. I cut these from another friend's yard, with permission, of course. 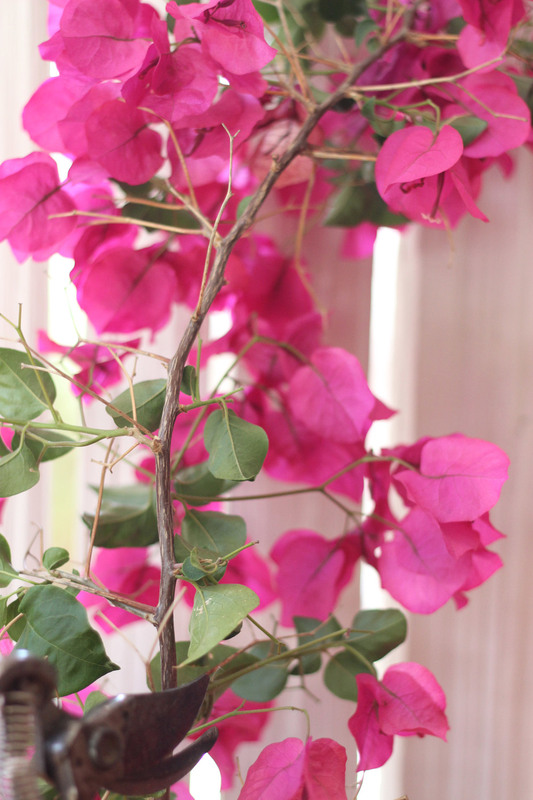 The light pink blossoms that look like the Bougainvillea are sweet peas. The purple berries are Privot Berry. They are not in season here. They flew in all the way from Australia. This arrangement has very horizontal lines, and you have to work at it to achieve this. It is natural to build an arrangement up vertically. In this arrangement, you build the structure horizontally, so that the arrangement goes out quite a ways on both sides, and so that it is fairly level across the top. You have to keep reminding yourself of this as you add the flowers...out, not up. Well enough talk, let's get to work. Size foam for a snug fit. Cut off corners. Shape bottom of foam to fit vase. 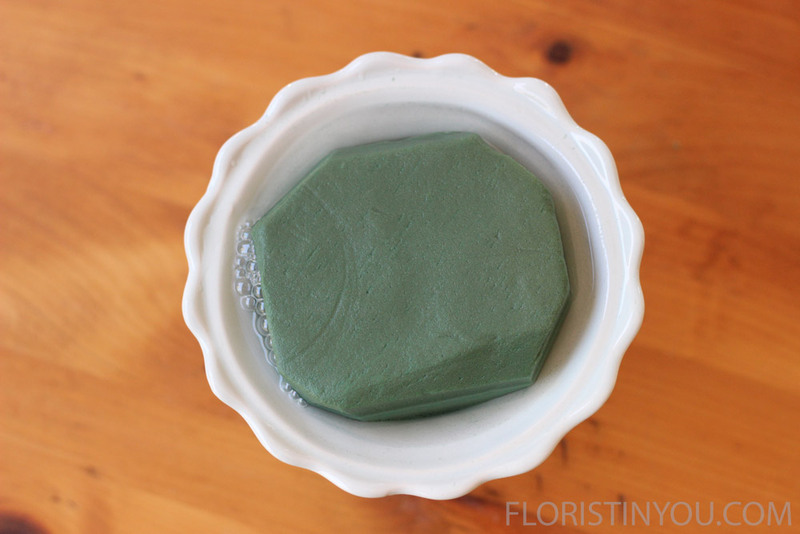 Fill with water until foam is saturated. It will take a lot. Fill to the brim. It should look like this. Cut 6 stems. This is called a Calamondin Lime tree. I call it 'The Devil Tree'. Beneath each leaf lies a real nasty thorn. Yikes! Cut off thorns. Now make 2 equal groupings. Insert 3 stems on left and push stems down into foam. Put other grouping on right. Push into foam. Take 1/3 piece wire and wire in the middle. Cut 2 Bougainvillea 14" long. Trim leaves off bottom 6". Nice shave huh? Only a little stubble. They should be roughly equal in size and shape. Push Bougainvallea stem in foam on left side. Push bougainvillea into foam on right. Wire around Bougainvillea and lime stems. Place 3) 12" lemon leaf stems, 1 center, 2 at 45 degrees. Place 3) 12" Baroness Roses, 1 at center, & 2 at 45 degrees. Cut 4 orange ranunculus from 4.5 - 10.5 inches. Cut 7 yellow ranunculus from 4.5 - 10.5 inches. Add 2 orange ranunculus to front (save 2 back). Cut 9 sweet pea stems from 6 - 9 inches. Begin placing the yellow ranunculus. Place 3 forming a 45 degree line. Add sweet peas. Cut 4 privot berry from 9 - 12". Cut 4 lemon leaf 7 inches long. Add half of privot berries to sides of front. Fill in under Gemini Roses with lemon leaf. Repeat steps for back. Use New Zealand instead of Gemini. Here's the back. Wow you are done!